I first met Tyler with an email he shot me right before my hiking project got into full swing in May of 2011. In the almost two years since, he’s become quite the blogger and I love reading his stories. His great combination of writing and photos is a wonderful balance. His adventures are great, ranging from restoring an old car to skiing sweet lines in the backcountry to a video on building a snow cave with his brother. 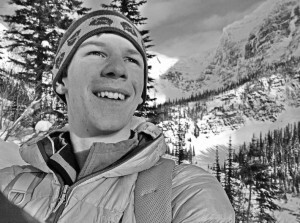 He’s got a great love for the outdoors, Montana and Glacier and I think you’ll enjoy reading his blog which is called “Get Out Adventure“. If you want your blog/video/photos featured on “Feature Friday”, please head on over to my Contact Page and send me a link to it! I love helping out people with their Glacier trips and love even more seeing how great they were! Next post: Spring Cleanup Giveaway!